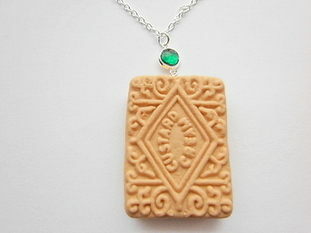 Safe and non-harmful polymer clay baked Custard Cream biscuit pendant with yellow cream in the centre. 6mm gemstone man-made emerald stone and attached to a 18in silver plated chain. * Not suitable for children and not eatable.